“White Christmas” may be one of the most iconic Christmas movies of all time, if not one of the most iconic movies of all time. It’s hard to even say the title without beginning to hum the title song. This is all for good reason, this movie is great, but not for the reasons you might think. What makes White Christmas interesting is that it isn’t really a Christmas movie. Other than the title and title song, there isn’t really much about Christmas in the whole movie. Sure it is set at Christmas and the cast even dresses in fur trimmed red velvet outfits, but not much else. Other Christmas movies tend to talk about the true meaning of Christmas, or the Christmas spirit, or something of that nature. Not White Christmas. Even the two love stories seem to be somewhat tangential to our heroes main focus. In the end this is really the story of two Army buddies trying to save their old general who they greatly respect. Oh and they really want it to snow. 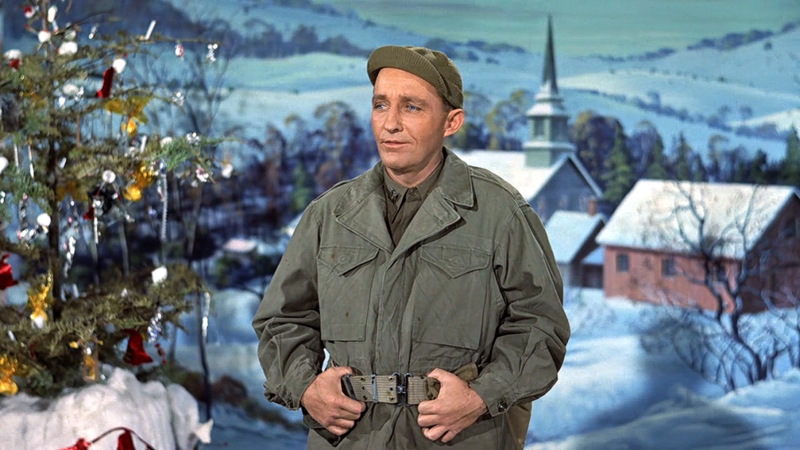 The movie opens in 1944 during the war where Bob and Phil, played by Bing Crosby and Danny Kayne, are serving. Here it becomes quite obvious that their commanding general, Major General Waverly played by Dean Jagger, is a loved almost father figure to the men. Fast forward several years through the shenanigans that lead our duo to a ski lodge in Vermont, and they once again come face to with their beloved general. The general owns a ski lodge that is having a hard time making ends meet due to the lack of snow, and the general is afraid he’s going to lose it all. Bob and Phil manage to get the message out to their old outfit that they need their help, and they all come to the aid of Major General Waverly. To these two men the most important thing in their lives was the war and the men they served with, that is their true family. So from that perspective this is the story of two men trying to get the whole family together for Christmas. I’m sure someone somewhere could use this movie as a starting point to examine the deep effects of the war and PTSD on the Greatest Generation. This idea seems just as relevant today, which may be why it still holds up so well. I don’t say any of this to diminish the amazing performances of Rosemary Clooney or Vera-Ellen, both are great in their respective roles. And don’t over look the musical aspects of this movie either, “White Christmas” sung by Bing Crosby is the best selling single of all time. And the dance numbers are great too, Vera-Ellen was one of the youngest Rockettes, and her dancing skills are amazing. But to call this movie a “Christmas Movie” and relegate it to sentimentalism that pops up once a year is selling it short. This is a movie that brings up the topics of war, growing old, exploitation in media, and what it means to be a family. This is a great movie, and I hope you will enjoy it with an open mind. Tomorrow is Santa Claus (1959) by Kelley, hope to see you all then!